The Discipline Priest is well suited for PvP. Very effective healing and very hard to kill, what more is there? Your shields and heals and abilities almost make the job too easy. Scroll down for the info. Warlords shifted things around, just a bit (snort.) 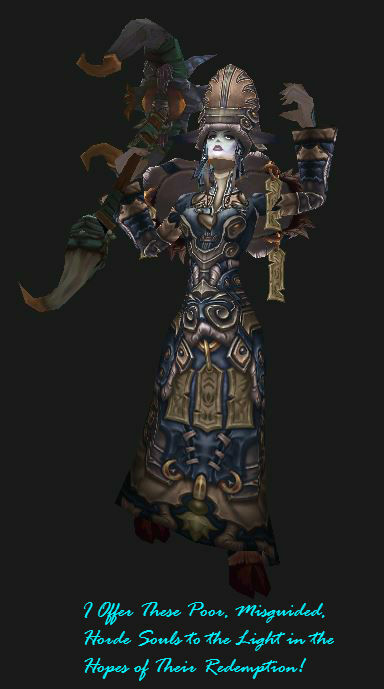 Here are all of the Priest changes in WoD. Among a whole bunch of other things, you achieve Enlightenment at level 90, crowd control isn’t nearly what it used to be, and a bunch of abilities have been removed, shifted, or changed. And Resilience, Hit, Expertise, and PvP Power are all dead. 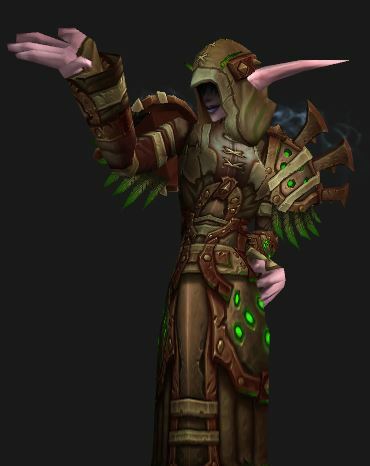 Note: if you’re more interested in Discipline for Raids and other PvE then see our other Discipline Priest page. Feel Free to like, share, or comment on this page if you find it useful. Add your bit in the comment form, at the bottom of the page, especially if I missed something here or you want to see something added. Discipline PvP Build, plus glyphs and D. Priest abilities. Desperate Prayer instantly heals your for 30% of your health. Nice. Esp. when it crits. Add it to a macro with other useful instant abilities. Spectral Guise gives you a brief kind of Stealth, which can help you escape or better position yourself. The shadow’s speed can be boosted by the Angelic Feather and similar effects. This is the best pick for nearly all situations, except where stealth is not effective, such as in the coliseum. DOTs won’t break your guise, but attacks to your main form eventually will. Angelic Bulwark throws up a shield to protect you when you go below 30% health. This is a passive effect that does not take up a keyslot. It won’t help you if you start at 31% and then take the big hit, but neither will the other two. Body and Soul increases the target’s movement speed, briefly, when you cast Power World Shield or Leap of Faith on them or (yourself.) Since you will be casting PW: Shield a lot you will get this boost a lot. More expensive then the others. Phantasm greatly improves your Fade ability: for a brief time it removes roots and gives you unhindered movement for a short time. Very useful. If you need another escape more than the movement then this is your pick. Surge of Light – Instant and free Flash Heals are pretty nice. Power Word: Solace – damages an enemy and restores a bit of mana. Useful for teams doing burst and control. Void tendrils – roots a group of targets close to you, giving you a chance to move away or lock someone into a poor position. They can still cast spells and ranged attacks, so the Scream is better. Psychic Scream is the most useful. It sends the melee away from you while you get out of there. It can also put their healer in a bad position. Dominate Mind – this is your mind control. It definitely has its entertainment value at times. You can’t do anything while controlling and it has a long cast time, so skip it. Twist of Fate – you do more damage and healing after healing a low health target. Nice in the BGs where it will be easy to find low health targets. Power Infusion increases casting speed and reduces mana costs for 20 seconds. Nice for when that burst is needed. Works well with your Borrowed Time. About the only downside is that it’s easy to purge/dispell. If that’s not a concern than this is a very solid pick. Spirit Shell is nice, especially when you get CCed right after putting one on yourself or your partner (who is suddenly being pressured.) Best for arenas. You can also use this to cast some extra shields at the start of the arena match. The “best” one here depends on what you’re doing. None are particular good for arena and the heals are underwhelming. Cascade: Your Holy Bolt bounces from target to target, doing damage to each, preferring longer range targets and never hitting the same one twice. Reveals stealthed and invisible targets if it hits them. Divine Star: Your star blasts outward, straight away from you, damaging enemies and healing allies along its path, and does the same on its return. The least expensive of this tier to cast. Can be used if the Holy school is locked. Best choice for small groups and arena. Reveals stealthed and invisible targets if it hits them. Instant and cheap is why it’s the pick. Halo: A Ring of Power extends outward from your location damaging enemies and healing friends and doing max power at 25 yards. Has a cast time and doesn’t heal for much. Does not break stealth. Clarity of Will another shield with a long cast time. Words of Mending adds a nice little boost every time you get ten stacks. If you don’t care for Saving Grace (and many don’t,) then this is a good pick. Note that it’s sometimes possible, with the proc, to have two P of Ms bouncing around. Running around casting Holy Nova, when nothing more is needed at the moment, will help to quickly build stacks. Saving Grace is a very nice emergency heal, such as when you come out of a CC chain. This is not something you want to cast too often, due to the debuff, but there are times when you need it. There are a number of useful Discipline Priest PvP glyphs. You will want to buy all of them (need the gold?) and experiment to find the best set for any given fight. Grab the first three depending on what you are doing. Penance – Cast Penance while moving. Very nice, even with the increased mana cost. Shadow Magic gives immunity to silence and interrupts for 5 seconds, but the cooldown of Fade is now 1 minute. Weakened Soul – The Weakened Soul effect of PW: Shield is reduced by 2 seconds. This allows you to cast more shields over the time of a battle. Fear Ward for fighting Warlocks or Priests or other scary types. Reflective Shield – reflects 70% of damage done, from one shot, back at the attacker. Inquisitor causes your PW: Solace and your Inner Fire to do more initial damage and a portion of that increased damage comes back to you. This damage will break you out of CCs, such as Polymorph. Best used against mages, not so much use against others. Mass Dispell – Allows you to dispel the undispelable, including Paladin bubbles and Cyclones. Binding Heal allows your Binding Heal to heal a third target, but at a higher mana cost. Leap of Faith removes roots and such from your target. Restored Faith causes your Lap of Faith to pull you to the target instead of pulling him to you. Levitate is a levitate speed increase. Minor Glyphs are all cosmetic. None (in 5.3) have real use. Borrowed time makes the effect visual. Heavens and Shackle change the look of the powers. In Warlords your Hit, Expertise, PvP Power, Resilience, and Reforging are all dead and buried. Did youi want to perform the last fights for them? We’ll pause. You have two new stats, Versatility and Multistrike. You now achieve Enlightenment at level 90, whcih adds 5% crit from all sources, giving you a 10% base Crit rating. Int now only adds to Spell Power, it no longer adds anything to any other stats. Int is point by point you best stat. Vesatility is a direct add to your damage, your healing, and (at 50% value) your damage reduction. The last why it rates as highly as it does. If you’re not under a lot of pressure then go for the Mastery. Multistrike gives you a chance (two chances in PvE) for one copy of your attack/heal at 30% effect (based off a new roll and not that mighty crit you just got.) Like Crit, Multistrike is less effective in PvP than PvE, as you only get 1 chance at the extra shot. Haste speeds up everything you do, which has obvious value. It does nothing for your shields, which is where the majority of your value lies. Spirit really depends on your mana usage. If your mana use is fine, then get other stats. If you can’t last through a fight then check your routine and get more Spirit. There are no gem sockets in Warlords Season 1 PvP gear, so there is no gemming. If you seed more gold to buy more gems and stuff, then see Hayden’s guide to massively improve your cash flow. There are plenty of sockets on lower level PvP gear. If you’re doing that then gem for Int and Crit (below 80) or Int and Mastery from 80 to 90. Gem sockets are not available on PvP gear. They have a (small) random chance to appear on Raid gear, so perhaps they’ll also appear on PvP gear and other items as well. Enchant for Versatility – as with the gems, enchants for somewhat lower level items are also included. We have a full page for all the Discipline Priest PvP Gear, with all the items and all the details. This section is the short version of that page. If you’re strapped for gold then take a look at the Tycoon addon. At 90 you can get the Crafted Malevolent PvP set or the Timeless Isle gear. You’ll replace it soon enough, but it’s a nice jump in item level from your questing gear at 90. At 91 you can equip some pretty decent drafted pieces. They’re not nearly as good as the level 100 PvP gear, but they’re way better than anything you’ll find questing or in the dungeons. You can equip three pieces of crafted gear, there is no crafted PvP set in Warlords. Yet. PvP gear, as soon as you can get it. Why? The PvP gear has two item levels, one for PvE and one for PvP. The honor gear, for example, is 620/675. So it’s 620 in the dungeons and 675 in any PvP situation. That makes it a higher ilevel than any PvE gear you will find. Because going into the RBGs or Arena with full honor gear will be much less painful than doing it with questing, or even dungeon, gear. PvE gear is uprated in instanced PvP to 650, but the PvP gear starts at 660 and so is clearly better. There are actually three tiers of PvP gear in Warlords. Primal Aspirant is ilevel 600/660 and is found in strongboxes won from the BGs of Ashran PvP events. It can also be found as “Warforged,” which adds 6 item levels. Primal Combatant is the honor gear. It’s 620/675 and can also be Warforged. Primal Gladiator’s Satin Robe has the set bonus, which you probably really want. This piece has Crit & Mastery, which isn’t bad. Primal Gladiator’s Robes of Prowess has no set bonus and comes with Haste and Mastery, which isn’t quite as good. Primal Gladiator’s Raiment of Cruelty, has no set bonus, requires the faction rep, and has Versatility and Multistrike. Our suggestion is to go for the pieces with the set bonuses. 2 piece Set: Penance now increases the movement speed of a friendly target you heal by 30%, and decreases the movement speed of an enemy target you damage by 50%. 4 piece Set: Reduces the cooldown of Pain Suppression by 60 sec. Your PvP trinket (escape) is #1, if you don’t already have one. If you already do then save its upgrade for last. These are what define you as a Discipline Priest. 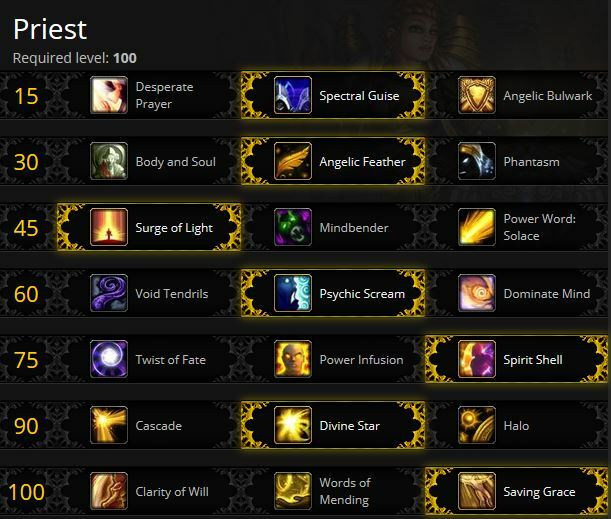 Abilities common to all priests are not shown. Spiritual Healing – Increases your heals. Meditation – Regen more mana while in combat. Holy Nova – Area effect damage and heal. Atonement – Your damage spells heal a nearby ally. Grace – Improves your healing on one target for a few seconds. Prayer of Healing – Heals all (close) party members. Evangelism – Build stacks and Archangel uses them to improve healing. Archangel – Consumes your Evangelism for more healing. Mastery: Shield Discipline – More healing and better shields. Divine Aegis – Critical heals put a shield around the target instead of additional healing. PW: Shield will absorb twice as much on crits. Pain Suppression – Reduces the damage taken by the target for a few seconds. Power Word: Barrier – Protect a group with a barrier. Silence – One of the few silences left in the game. 5 seconds of blissful quiet. Borrowed Time – Casting PW: Shield lets you gain 40% more Haste from all sources for 6 seconds. Purify – Remove Magic and Disease from targets. Leap of Faith – If your partner is CCed, or being heavily pressured, you can yank him away from his attacker. The better your positioning (for example, if you’re on a ledge or platform) the better this works. If you use the glyph you can move to your ally, then get a fear off. Your perk (Enhanced Leap of Faith) modifies your Leap to buff your next heal on that same target, after “gripping” him, by 50%. You yank him out of danger then get off what’s basically a critical heal. Glyph of Restored Faith causes your Leap of Faith to pull you to the target instead of pulling him to you. Fear Ward – Fire off Fear Ward right before the encounter and it might well be up again before the encounter is over, maybe when you need it. Or wait until right before engaging that Fear using opponent and then Fear him. Or when you see that priest using a feather to come by to Fear you or your DPS/Ally. Dispel Magic & Purify – Dispel your enemy’s buffs and Purify away your ally’s CCs and Diseases. (Yes, this is why DKs hate you.) Purifying away those CCs on your team is very important and will help win games. You can clean the enemy buffs as soon as you’re within range, which will help your team apply effective pressure. Remove their shields, Icy Veins, Pyro! procs, etc. Mass Dispel, with Glyph of Mass Dispel, is for removing Ice Block, Paladin Bubbles, and Cyclone. Also removes stuff like Mass entanglement and Warlock DOTs from your whole team (if they’re in range.) Use Dispel Magic for single dispels and and save Mass Dispel for the big stuff. Also, since it’s a targetable area effect you can dispel effects from a teammate even if they’re stuck around a corner, out of your Line of Sight. Point the center of the area at the corner and fire away. It’ll hit everything appropriate in that area, even if out of sight. Try to time your defensive cooldown for when the opposition is bursting with their offensive cooldowns. Pain Suppression – Reduces the damage taken by the target by 40% for a few seconds. That pair of Rogues unloading on you is a good example of when to use this. Psychic Scream works well as an interrupt, too. Best used against healers and such. Against Warriors and DKs you might want to look into Void Tendrils instead. Silence – get that Warlock to shut up for a moment, while you keep healing. Best used as an interrupt for spells that have cast times. The glyph reduces the cooldown to 20 seconds, but shortens the duration by 2 seconds. That doesn’t matter much if your primary use of it is as an interrupt. Use it to interrupt Fears, other CCs, Heals, etc. Also it doesn’t share diminishing returns with other fears or similar effects that your team may be casting. Assistance from your team. Such as your Paladin helping you out (hand of freedom) of that 8 second stun that Combat Rogue just dropped on you. Dwarves have Stone Form as a major defensive cooldown, as it removes all kinds of effects (DOTs, for one) and reduced physical damage by 10%, such as what that Rogue is doing to you. Mind game – This depends on you knowing the enemy and being able to make educated guesses about what they might do. Faking a cast to get them to blow an interrupt is an example. Psychic scream. Spectral guise, run to enemy, Fear. You can angle Fears (since they run straight away from you) to get the opponent(s) to run in “the right” direction, such as behind a pillar or away from their DPS. The Glyph of Psychic Scream will cause them to tremble in place, instead of run, so it’s effectively a stun. Might be nice if your ally likes to drop area effect attacks. Void Tendrils is nice against double melee teams or anyone who can easily deal with your Fear. Melee will generally have to hack their way out of the Tendrils. Also, if you team already has Fears then Tendrils is something that doesn’t share diminishing returns with those fears. Glyph of Restored Faith causes your Leap of Faith to pull you to the target instead of pulling him to you. Pay him a visit, cast fear, send baddies running, your ally is now happier. If you ally moves to a higher position you can grip yourself to him. Angelic Feather is a really nice sprint which you can use with teammates. Glyph of Penance, which allows Penance to be cast while moving. Dispel Magic, while not a speed boost, can remove slowing/rooting effects from you, freeing up your movement. Since this video was made he’s decided that he likes Mindbender and Power Infusion. This video will cover the basics of how to be a D. Priest. Go here if you need some basics on macros. Cast a Fear Ward on the named player. You can also use party1, party2, etc. instead of healername. mouseover also will work. or on yourself, regardless of who you already have targeted. Use a set of macros to dispel your team. You can use the name of the player or a focus target or a mouseover or yourself. Just make a separate macro for each: target=NameOfYourBuddy, target=focus, target=party1, target=player (that’s you,) and so on. Shadow Word: Pain/Devouring Plague Macro: Here it is. Priest leveling is easy, especially for Shadow. Holy and Disc. can level in PvP or Dungeons and Shadow can do all of that and quest effectively. Then you hit the top and the game changes. And then you have those other alts you want to level though those 100 levels. 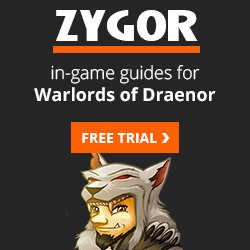 With the thousands of quests to 100 and a bazillion mobs to kill (not to mention other players, but they don’t count here) sorting out which quests are best and which series of quests will get you to 100 the fastest is important, which is why we highly recommend Zygor’s Guide. Playing with Heirlooms and/or Recruit a friend? Gaining a few levels in the dungeons or in PvP? Zygor has your back. The guide knows what level you are and will correctly suggest where to go next and will let you dump all of your obsolete quests. You will probably never need to look at your quest log again. Grab your copy here and get to 100 as fast as possible, or read our review, first. Do you really think Versatility is the way to go? Because right now I’m focusing on crit. (Didn’t know for example that in pvp combat healing crits are only 150% instead od 200%. As a Discipline priest that shouldn’t be a problem though, because you don’t “crit” anyway. Is Versatility THE stat? Kinda depends on your game. It’s a direct add to any damage and healing that you do and also provides damage reduction, so is pretty useful overall. Crit and Mastery are still good stats. A Versatility/Mastery build would give you better heals and more Shields.